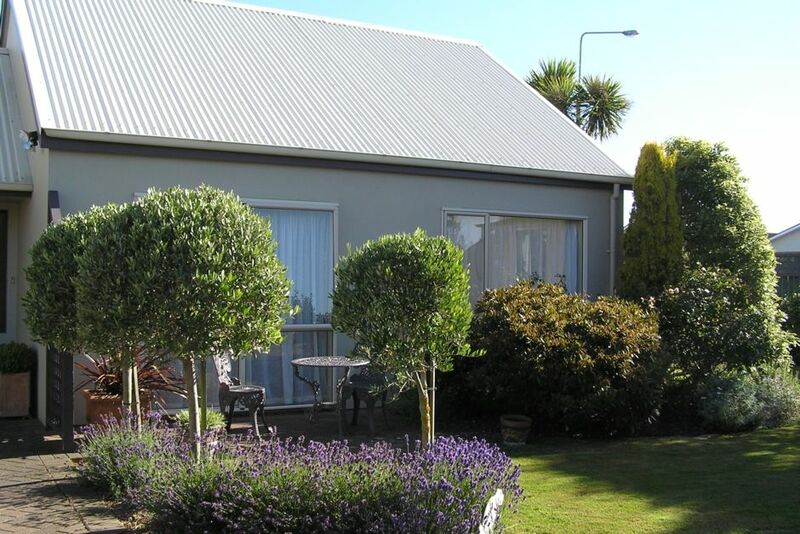 The cottage is set amongst olive trees and lavender bushes. Native Tuis and Korimako (Bellbirds) frequent the garden and plump Kereru (native wood pigeon) arrive here in the spring. The compact sunny bedroom has a comfortable Queen size bed with lambs wool underlay, fresh cotton sheets with goose down duvet plus electric blanket and spare blankets. Double wardrobe and drawers. The kitchen has dishwasher, full oven and 4 ring stove top, microwave, fridge freezer. Table & chairs and all you should need for cooking. Sunny living area has a comfy 3 seater couch and chair. Flat screen TV and radio/stereo/cd player. Plenty of plugs for devices. Laundry with washer and dryer. Drying rack. Sunny out door clothesline. Outdoor seating areas, kick of the shoes and walk on the soft grass and wander around the garden. The cleaner comes in weekly and between guests. We will stock the pantry on request. We are two minutes by car or 15 mins walk from the city, with cafes, bars and 2 min walk to closest restaurant. 5 min walk to Information Centre, Museum and Art Gallery, 80 hectares of beautiful Queens Park with 18 hole golf course, Frisbee golf, playgrounds, animals and aviaries. Aquatic centre 2 blocks away. Richardson's Transport Museum and Motorbike Mecca are a must see along with E Hayes and Sons. 5 min walk to Rugby Park and Southland’s Sport Stadium and Velodrome. 5-minute drive to Airport and Hospital. Close to excellent trout fishing rivers. 10 min drive to Oreti Beach. 20 min drive to Bluff. Only a couple of hours from lakes and mountains. Close to supermarkets – shops and bus stop just around the corner. We are close to the Southern Scenic Route. We can negotiate long term rates. Stroll to lovely Queens Park and the Tuatarium. Heat pump in living room, electric fan wall heater in bathroom. Sunny warm living area with doors to patio outside. Beautiful garden with patio furnishings. Gracious, friendly hosts, Jill and Paul. Thanks for a great visit, Maureen and Dennis. It was great to have you stay in our wee cottage and lovely to meet you both. Most welcome back anytime. Fun travels. Great upmarket accomodation in Central Invercargill with wonderful hosts. We thoroughly recommend to other hosts. Please see comment above- highly recommended - it was perfect. Please see comment above- highly recommended - it was perfect. Obviously the owners look after their property, it's was 110% perfect. Fantastic experience from initial contact with Jill to leaving this cosy well thought out accommodation. Although the weather was miserable we left with wonderful memories! Located in close proximity to the town centre and "up-market" shopping in Windsor. Located in close proximity to the town centre and "up-market" shopping in Windsor. The unit was very well equipped and clean with a lot of unexpected extras provided, including food..
Well appointed, clean and central - what more could you ask for! Well appointed, clean and central - what more could you ask for!! An excellent property to stay in! !